Overseas Fijians including high profile figures in Australia plotting against the Government have been warned they will be tracked down and brought to justice. Prime Minister Voreqe Bainimarama made the warning yesterday. He said the warning applied to Fijians here and abroad. “If you encourage sedition, you are committing a serious offence. If you urge violence against anyone in Fiji, you are committing a serious offence. 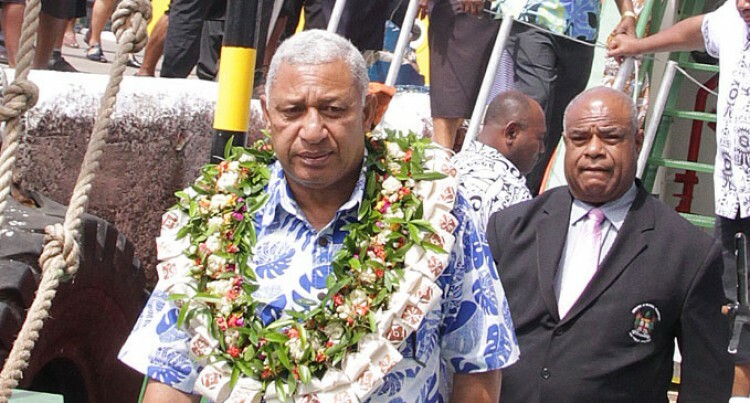 He was speaking at the commissioning of the new Government vessel MV Cagivou at the Government Shipping Services wharf in Walu Bay, Suva, yesterday. “The people behind these insurrections don’t believe in democracy – in listening to the will of the people,” he said. will on everyone else. They are enemies of the State and enemies of the Fijian people. They are enemies of investment. They are enemies of a modern Fiji. They are enemies of prosperity for all Fijians. “To those Fijians in the areas where these people are operating, let me say this: Do not be fooled into supporting breakaway states. It is not only illegal but even if they were permitted, they would have no hope of surviving economically. “You would be poor as well as foolish. So turn your backs on these messengers of division. Report any illegal activity to the Police. And if anyone you know is involved, tell them they risk spending many years in jail, with all that would mean for your families and your community. “This is why the current attempts to divide us are so misguided. Because it is only by working together as one nation, one Fiji, that we can improve the standard of living of the Fijian people. To those Fijians tempted to listen to the voices of division, I want to say this: There is no threat to the iTaukei. There is no threat to Christianity. Our Constitution – our supreme law – guarantees the protection of this for all time. The people who are telling you otherwise are liars. They are trying to fool you into supporting them. To back their crazy ideas to break away from Fiji and establish so-called Christian states or overthrow the current Government altogether. “You need to listen to me very carefully. They will not succeed. And if you are foolish enough to join them, you will be severely punished and could spend many years in jail. “The current Government was chosen by the Fijian people as a whole at the election almost a year ago. It is the only lawful government. And to challenge it is to defy the will of the Fijian people. It is an attack on democracy and it will not be tolerated. “I am amazed that SODELPA has not joined me in strongly condemning these elements threatening the integrity of our nation and the health of our economy. It can only mean one thing: that SODELPA also doesn’t respect the will of the Fijian people, freely and democratically expressed at the last election. “They are failing to defend democracy. They are giving comfort to those who want your democratic choice last September overturned. It is a betrayal of democracy. It is a betrayal of the Fijian people. And it confirms that SODELPA is not only totally unfit to govern but is unfit to even sit in a democratically elected Parliament. Shame SODELPA, shame. “Thank God that the overwhelming majority of our people are supporting the principle of unity, not division. Thank God that the rest of the nation has its eyes on building a better future for everyone. “Unlike SODELPA and these troublemakers, I have a fundamental belief in the intelligence and common sense of the Fijian people, including our youth, our young Fijians. They have no interest whatsoever in more of the instability that held our beloved nation back for nearly three decades. Because they know it kept everyone poor except the elite. It deprived everyone of the services they deserve while certain people got rich raiding the National Bank of Fiji. And it kept our nation weak and perpetually unable to move forward.